Something to think about at this time of year is making a perennial vegetable bed; that means vegetables that will continue to grow year after year, some examples are asparagus, globe artichokes, Jerusalem artichokes, sea kale, cardoon, chicory and varieties of broccoli, and onion. Check out the internet or nursery/garden centre for crops available as ready grown plants or I like to grow plants from seed – that way you get a better choice and some more unusual varieties. Asparagus is a real favourite and there are many wonderful varieties to try ‘Gijnlim’ have masses of thin spears and have got a really good flavour. The variety ‘Violetto d’ Albenga’ is an Italian variety and has lovely purple spears. If you have prepared a bed for your asparagus now is a good time to plant them. Asparagus is expensive to buy in the shops but it is easy to grow and tastes delicious when freshly harvested. Once established, twelve plants will produce an average crop of 10kg (22lb) annually for twelve year or more. Try to buy one year old crowns as these will establish quicker. Space the plants 38cm (15”) apart in row 1m (3ft) apart. Globe artichokes are fantastic plants and give great architectural value with their silver, jagged edged leaves, and also give you edible flowers. The artichoke is a really stunning plant, at The Garden House we use it as our symbol and sell the seeds of it. It is easy to grow from seed, and then needs to be planted in well-drained soil in the sunniest possible site as they are slightly frost tender. You may need to cover them with fleece during severe weather. It is possible to propagate them now so if you have a friend that has some ask them if you could have a cutting. All you need to do is to take a side shoot from the parent plant, use a knife and remove a side shoot far down as possible – preferably with a piece of root attached. Pot up your cutting and water it well and keep it well watered until it has settled down, cut down the leaves if they are really long, to about half to reduce water loss. You could try ‘Green Globe’ or ‘Purple Sicillian’ – this one produces lots of small purple heads. Cardoons are similar to artichokes, (they are the wild parent of the artichoke) but the are grown for their edible leaf stalks not their flower heads. They were very popular in the Victorian era. They can reach up to 2m (6 ½ ft) and is usually grown as an ornamental. They must be picked when young, before spines develop. They require blanching, like celery, this means gathering all their leaves together and excluding light with black plastic or cardboard in later summer for two or three weeks. The midribs can them be steamed or boiled. Chicory can be treated as a perennial and some bitter leaves can be gathered early or late in the season, after any hearting rosette has been cut. It can grow to about 60cm (2ft). Jerusalem artichokes can grow to 9ft and make a really good wind break, related to sunflower they are covered in bright yellow flowers. 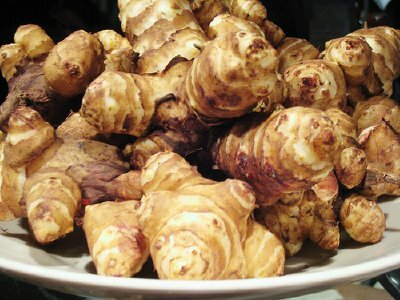 You can make soup or roast their fat, knobbly tubers which have a lovely flavour. To grow, plant the tubers 15cm (6”) deep and 30cm (12”) apart. Draw up the soil around the bottom half of the stems when they are 30cm (12”) tall to give them some support. In mid-summer cut most stems – leave a few so you can enjoy their flowers – back to about 5ft. Prune the plants to leave 8cm (3”) stumps above the ground when the foliage starts to turn yellow later in the year. You can harvest them between autumn and late winter. For something different try some perennial onions. The tree onion forms clumps of edible bulbs at the ends of the flowering stems that can be used like shallots, they also make offsets around the base of the plants which you can use instead of spring onions. Welsh onions are lovely and look a bit like chives but they can be pulled from the ground to use in salads. I think that sea kale looks lovely, especially growing in a seaside city. It is an old Victorian vegetable and is hard to get hold of but you can grow it from seed. It is illegal to harvest it from the wild. It appears in late winter when few other fresh vegetables are ready – this is because it is traditionally forced, like cardoon and rhubarb. Many of the perennial vegetables can be found at Delftland Nurseries, organicplants.co.uk or VictorianaNurseryGardens victorianananursery.co.uk. You could also try the Real Seed Catalogue, realseeds.co.uk if you are looking for some unusual tubers to grow.